Western blot analysis of HeLa cells, untreated, staurosporine-treated (1 µM) or cytochrome c-treated (0.25 mg/ml), and Jurkat cells, untreated or cytochrome c-treated, using Caspase-9 Antibody (Human Specific). 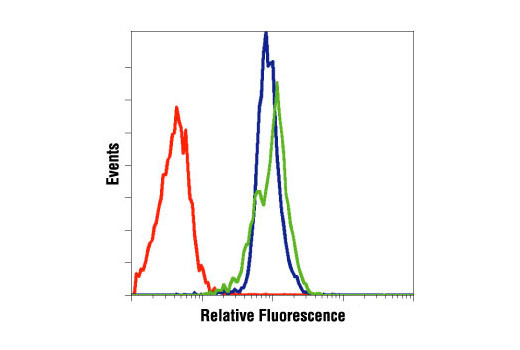 Flow cytometric analysis of Jurkat cells, untreated (blue) or etoposide-treated (green), using Caspase-9 Antibody (Human Specific) compared to a nonspecific negative control antibody (red). 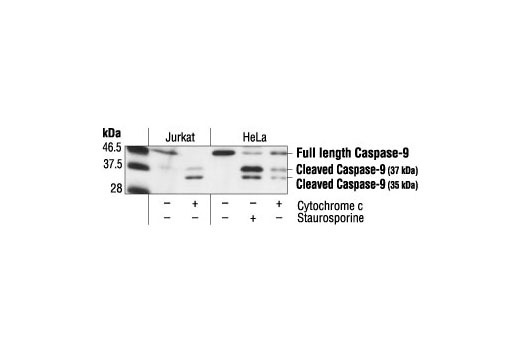 Caspase-9 Antibody detects endogenous levels of full length caspase-9 (47 kDa) and large fragments of caspase-9. The antibody does not recognize other caspases. Polyclonal antibodies are produced by immunizing animals with a synthetic peptide corresponding to residues surrounding aspartic acid 315 of human caspase-9. Antibodies are purified by protein A and peptide affinity chromatography.